Tell me a little about yourself and how you became a tattoo artist? I first started tattooing in grade 12 with a couple machines that my dad brought home from a pawnshop. My brother had a friend who tattooed at an actual legit tattoo parlour and he let me hang out there and learn the ropes. I then started to tattoo on my own after my brothers friend left the store and I taught myself for the first year or two. I then met Trent Paré, a long time local artist who has been working for many years, who was kind enough to take me under his wing. Why is there a tattoo bed in the window? When I was first learning to tattoo, when I was pretty new to it, with a lot of the shops it was hard to find a job, so often I would just convince them to give me a job and it was like, “ahh…. I could just work right there? !” and often it was always working in some weird spot like just by the door up front which nobody ever really wants to work in cause it’s invasive with the public and everything but…I just got so used it so it was a no brainer when I was opening the shop, that there was this beautiful spot just right by the window. It’s super nice and people are always interested to see tattoos being done, so it’s cool to break that barrier and it becomes not such a mystery anymore to those who don’t have tattoos. It also makes it more inviting and the daylight is nice. Are you inspired in your art by the Gastown style and is there a specific style of art that can be seen in Gastown? 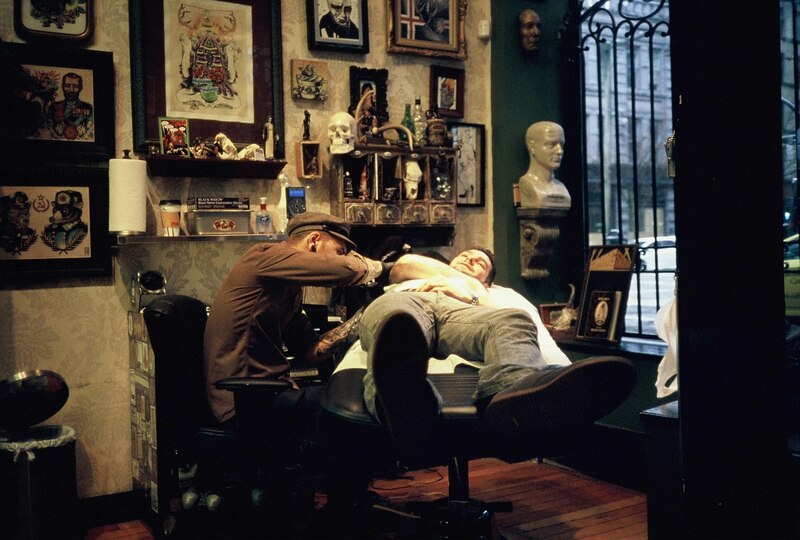 The neighbourhood is definitely an inspiring place to be, especially with the history and all the old stuff – and tattooing being an old trade – that’s part of the reason I opened the shop in Gastown. Ed Hardy, the famous tattoo artist; he actually had a shop here down in Gaolers Mews; the alley was a tattoo shop at one point. Unfortunately, it got torn down years ago and knowing the history behind that inspired me to open up in Gastown. There were sailors and loggers that went to his store and the classic designs that came from Ed Hardy’s shop; a lot of us here have a heavy influence from those classic style designs and the neighborhood has inspired that quite a bit. Most of our staff are young and everyone’s passionate and really going for it. We are all a little bit of a younger crowd and we have a variety of artists who are all doing something a little bit different. Given the amount of space we have in the shop, everyone’s able to do just that; to express their individual style and creative expression. It’s rare in Gastown to find a bigger space and most of the other tattoo stores are smaller so we’re lucky to have lots of room to work in and for our customers to feel comfortable in and for our artists to grow in their craft. And the selection and variety of what we offer is probably our biggest thing. What are your favourite places to eat/hang out in – in Gastown? Theres a ton. I go to Six Acres a lot – the food and beer there is really good; same with the Alibi Room. I often get breakfast at Save-On-Meats and Acme Café is probably one of my most favorite spots. Coffee is pretty fun in Gastown cause I can go to a different spot everyday yet I’m like a regular at all of them, you know?! They’re like ‘Oh, I haven’t seen you for a few days’ because you have to do your rounds at all of them! I buy most of my clothes in the neighbourhood. Dutil denim comes to mind – I’m pretty close with them and they’re super rad. Any cool events/stuff coming up for GTP this spring/summer? We’re stoked to celebrate our upcoming 5 year anniversary sometime in May. The Gastown Tattoo Parlour will be open to everyone with drinks and a BBQ –we’ll have an open house and give back to all our clients and local businesses and have fun. We’ll post details soon! You’ve been banished to a deserted island paradise, and as a lover of vintage taxidermy, you can only bring one piece from your collection. What would it be? That’s tough. Out of my current collection it would have to be my Wolf-head – I’ve named him Wolfred. I got him from a friend and it’s actually a really old piece of taxidermy. And all the pieces I collect are old and I wouldn’t support buying anything new to just to mount its head. My friend’s parents had an antique store in New West and there was a fire next door. A bunch of their antiques had fire damage and they had to get rid of them. I acquired Wolfred from them for free. Gastown Tattoo Parlour is open Open 7 days a week from 11:00am-6:30pm and walk-ins are welcome on Saturday.